Let Kilburn Shake is a rather ambitious project, starting in 1767 and finishing in 2028. It could have started even further back – Kilburn High Road, according to a paving stone there, was once part of Watling Street, established by the Celts and paved over by the Romans. Another one, towards the southern end of the High Road, reads ‘1770s Kilburn Wells Spa’. The ‘holy well’ that the play’s opening act talks about is therefore not entirely fictitious, and presumably the more religious-minded thought the whole thing an ‘abomination’, as they do in this play. The first act is set up well (geddit?) through the use of the printed press. While literacy was increasing as it had been ever since the Reformation, it was still not near-universal, and in the Kilburn of 1767 those who couldn’t read still outnumbered those who could (as this production would have it, at least). Viewed from an early twenty-first-century perspective, some of the prevailing views were frankly laughable. Ezra, one of the literates, extols the possible effects and benefits of curry powder – then, as now, one shouldn’t necessarily believe all that is published in the newspapers. In the second act (of four), set in 1968, Mick Meaney, a local tradesman, is to be ‘buried alive’. What this actually means is that he will be in a confined space underneath the Kilburn High Road with ventilation shafts and means to defecate (I shall spare you the details). Meals and the morning paper (and other items as required) will be passed down a large tube, though this ends up mostly serving as a shouting post for locals to hurl abuse at Mick. Mick’s reasons for undertaking the feat are largely, if not entirely, financial – he even talks about having to walk miles to and from work because the cost of bus fare is too prohibitive. He makes it – it would be a very short second act if he didn’t, and in the aftermath, there’s a turning point of sorts, but not one that Mick desired. The third act, set in 2003, had a lot of personal resonance – after seeing a play about Tony Benn recently, I have been reading his published diaries. His leading role in the Stop the War Coalition would almost certainly have commanded the respect of certain members of a local dance group, who are so pre-occupied with combating Tony Blair’s determination to push on with military action in Iraq that they push the issue to the top of their personal agendas, above dance rehearsals and even their own protest about the impending closure of the community centre which they use. The final act, set in 2028, is by far the most descriptive, the broadest and the most energetic. At first, after exploring a number of ways in which Kilburnites have strived and suffered over the centuries, the pumping music and enthusiastic rhythms that the cast dance to come across as though the show is trying to crowbar in a happy ending when a more reflective one would have been more appropriate. It took a little while to get used to all the descriptions of what is going on in various parts of the planet – will Kilburn lose its local identity altogether in the digital age? One particularly amusing video that went viral was about a rat in New York City who carried a pizza slice down a flight of stairs. The act was very much indicative of what the term ‘global village’ might well come to mean in the not too distant future. In this play with songs, the young cast rise to the challenge of playing a large number of characters in very different contexts quite brilliantly. While the dialogue occasionally resembles the talk of the school playground (I honestly started to have trouble keeping up with who was a ‘dickhead’ and why), there was the right mix of humour and pathos, punchlines and poignancy, that came together to make a slick and triumphant production. 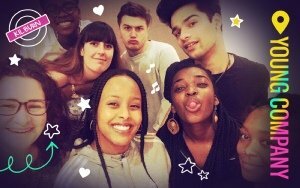 Taking place in Stonebridge, Kilburn and Neasden, Mapping Brent aims to build lasting relationships with communities and provide opportunities for local youth to engage in theatre; making work that is relevant to them. The project will culminate in six new and original performance pieces performed at Stonebridge Hub, St Catherine’s Church Hall, Kiln Theatre and The Grange Business Hub. Professionals from across the industry involved, include playwrights, Eno Mfon, Gail Babb, Carmen Nasr, Simon Brett and Sonia Jalaly; and directors, Stevan Mijailovic, Harry Mackrill, Dionne Reid, Tash Marks, Gail Babb and Ruby Thompson.